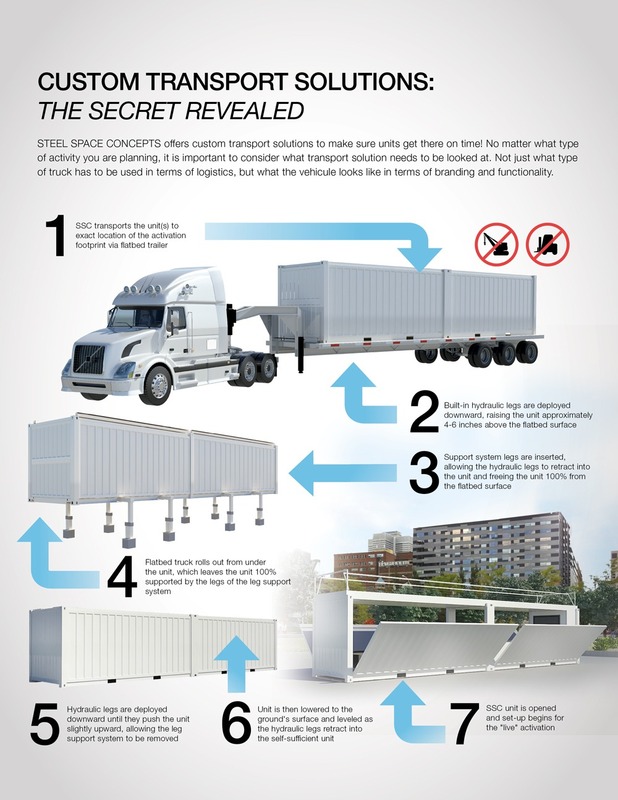 Why does Steel Space Concepts integrate a hydraulic system in its units? Steel Space Concepts integrates a hydraulic (10’, 20’ and 40’ units) and an electrical (SSLITE 8 and 16) lifting and levelling system. This allows our client to save on special equipment cost such as forklift or crane. Indeed, this allows the unit to be self-sufficient when it comes to loading/unloading it from the truck. This represents important savings, especially in tour scenario. Please refer to this infographic on transportation for more information on our hydraulic system. The hydraulic system and the gas cylinder makes it also faster to deploy the unit and complete the setup. You can therefore attend more locations in a shorter period of time with your Steel Space unit than with any other solutions. Can I handle the transport of the unit myself? Over the last few years, Steel Space Concepts has partnered with important companies in the transportation industry allowing us to benefit from cost effective rates for the transportation of your unit. Our team of experts can take care of all the logistics coordination on your behalf, allowing you to enjoy a total peace of mind. What is the LITE serie? What are its advantages? Steel Space Concepts has developed a LITE serie in order to offer more flexibility and also accommodate smaller budget. Indeed, the LITE units are build using the same concepts as the 10’, 20’ and 40’ units. They are built from new material but have a look similar to a shipping container. They also have a lifting/levelling system that allows to have the unit leveled even when the ground isn’t. Those units were designed to reduce their total weight which, combined to the trailer and part of the options included in LITE serie, allows our client to transport the unit themselves using a regular pick-up truck or a SUV. Can the units be manipulated using a crane or a forklift? Yes, Steel Space units can be manipulated using a crane or a forklift if required. Though, please take note that our units are equipped with a hydraulic system which allows in most cases to avoid using this kind of heavy equipment. What is the average cost of a Steel Space unit? At Steel Space Concepts, we offer many different options to our clients in order to accommodate a wide range of budgets. Indeed, we offer purchase or rental solutions for our different unit sizes, level of customization, etc. that allows to remain within our client’s budget while fulfilling all their marketing and promotional needs. What are Steel Space Concepts rental rates? Steel Space Concepts rental rates are calculated on a weekly basis and vary depending on the type of unit you are looking for. 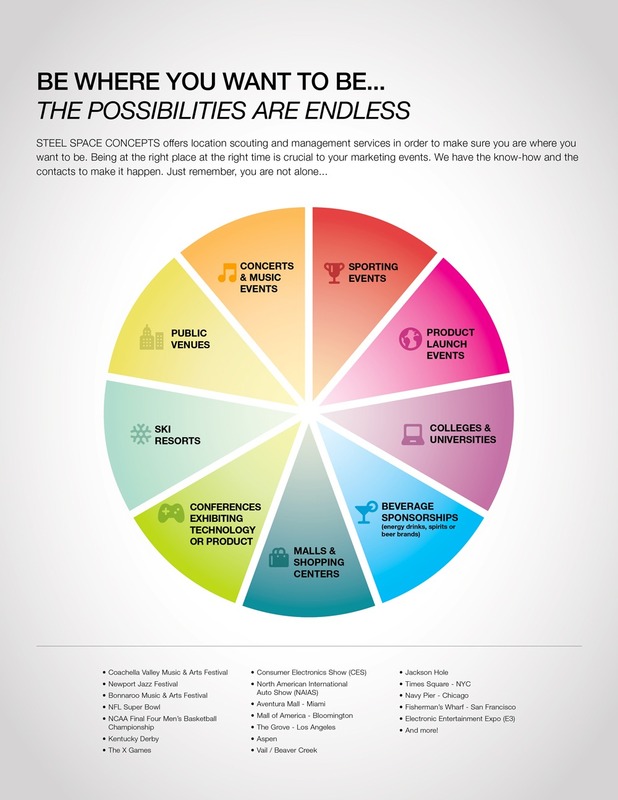 What are the cost savings related to the Steel Space Concepts solution? What is the typical timeline for Steel Space Concepts to build a project? As we offer different levels of customization of the units and we offer purchase or rental solutions, the timeline fluctuates based on those aspects. However, we can accommodate most of our client’s timeline when using our rental fleet of units, fixtures, furnishings and furniture. 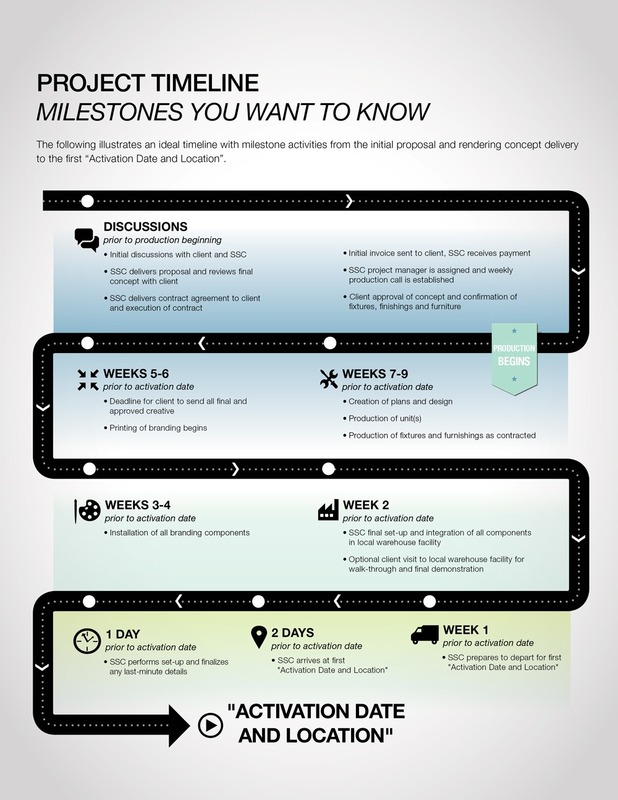 Please refer to this infographic on timeline for more information regarding the project development. What if my booth footprint is limited? Steel Space Concepts has a solution for you. Not only do we offer many different sizes of units, but our units are also customizable in terms of their deployment. Indeed, our unit can be deployed only on one side, 2 sides or all sides allowing you to fit within the required footprint. The deployment of our unit can also be changed from one location to the other allowing to benefit from the best possible deployment option at each location you will attend. For what industry can the Steel Space units be used? As Steel Space units can be customized for your specific needs, they can serve for companies and/or brands in any industry from retail to telecommunication or sports events. Please refer to this infographic for examples regarding the type of events where our units can take place. How can Steel Space unit be customized to my company and/or brand specific needs? When looking for a rental solution, Steel Space Concepts can customize the unit to your specific needs in many different ways. Indeed, the unit can be deployed completely or not depending on your available footprint or concept, extra walls can be installed in order to offer a private area or more product merchandising options, etc. Fixtures/furniture can also be built by Steel Space Concepts according to your specific needs, brand image, and so on. The branding is also another aspect that will be customized to your company and/or brand. Finally, our units offer the option of having a billboard on top or a mezzanine level allowing to enhance your visibility and the customer’s experience. For the purchase solutions, sky is the limit. We can build the container to fit your needs, we can stack them according to your concept, and paint it to your corporation color scheme. Can Steel Space Concepts help me develop my concept? Steel Space Concepts offers a complete service of design and engineering to help you through the realization of your project. We can help you create the space you need from a simple idea to its delivery.